Celebrate the special moments of the season with these unique collections of holiday carols by Alfred's favorite piano arrangers. Titles: The Christmas Angels, arr. Dennis Alexander (Angels from the Realm of Glory * Angels We Have Heard on High * Hark! the Herald Angels Sing), Christmas Bells, arr. Mary K. Sallee (I Heard the Bells on Christmas Day * The Bells on the Sleigh to Grandma¹s House [Over the River and Through the Wood / Jingle Bells] * Bells Are Ringing [Ding Dong Merrily on High / Ring, Little Bells]), The Christmas Manger, arr. Tom Gerou (What Child Is This? * Coventry Carol * Away in a Manger), The Christmas Shepherds, arr. Victor Labenske (How Great Our Joy * It Came Upon the Midnight Clear * The First Noel), He Is Born!, arr. Joyce Grill (Good Christian Men, Rejoice * Polish Lullaby * Il est ne * What Child Is This? 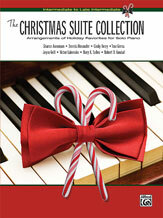 ), A Jazzy, Jolly Christmas, arr. Victor Labenske (Up on the Housetop * Jolly Old St. Nicholas * Jingle Bells), The Nativity, arr. Cindy Berry (Still, Still, Still * Lo, How a Rose E¹er Blooming * Joy to the World), The Three Kings, arr. Robert D. Vandall (March of the Three Kings * We Three Kings of Orient Are * O Come, All Ye Faithful), Three Moods for Christmas, arr. Sharon Aaronson (Carol of the Bells * What Child Is This? * We Wish You a Merry Christmas).